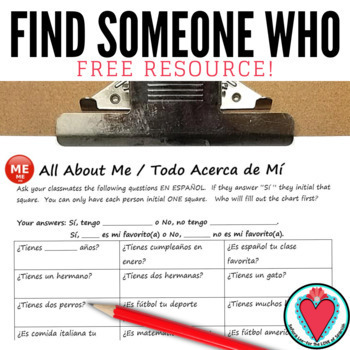 This Spanish speaking activity gets students up and out of their seats to "Find Someone Who" can answer questions about classmate's families, pets, favorite classes, sports and food. Students try to get as many signatures as possible. Fun and engaging activity! Appropriate for students in the middle of Spanish 1. Good review of the verb tener, family vocab, sports vocab, food, classes and dog/cat. Instant, no prep activity. Just print & speak! Is Spanish your favorite class? and more! "Great speaking activity to use at the beginning of the school year with Spanish 2 to get them speaking right away the 1st week!" "Such a fun activity to get kids moving and talking!" "Thanks! I needed something for some groups that I will see more than others during the first week and this is simple and perfect." Click ★ to follow my store! Receive monthly email updates of new resources, freebies & store wide sales!! Most new resources are 50% off for the first 48 hours.